I have recently started buying your soaps at Waitrose and am delighted with them. I love the subtle scents, the smoothness of the soap and the fact that they do not irritate my skin. I am writing to ask if you could introduce a range of shampoos particularly in the lavendar and rose geranium scents and preferably free from all nasty things such as parabens. Also a very strange, old fashioned request for a simple household soap which I love for stain removing, washing collars, etc. Most household soaps smell very utilitarian and something with scents of the country would be wonderful. Thank you. I have recently started using your Unperfumed Soap for Sensitive Skin and I really love it – purchased in Boots in Dublin. I have always washed my hands a lot and with most other washes they are regularly left rough, dry, sore and cracked. After switching to your unscented soap and within a few washes my hands seem to be healing quickly and completely – I am so pleased. Thank you for a great product and for having stockists in Ireland. A friend gave me your wonderful Pure Rose Geranium bubble bath for a present and just wondered if I can buy it either in Waitrose or Sainsbury or can I order direct from you? Wonderful products you have! I wanted to just take a moment of my time to write to you today and tell you how much me and my family love your products. When one of us uses your products, everyone else in the family always say how good they are. Thank you so much for making a great product and thank you for your time. Hi – I have been looking everywhere for a liquid soap which is not a detergent and have read the backs of so many labels only to be totally confused. I was so pleased to find your product in Waitrose – it clearly states that it is a liquid soap that does not contain detergents. I need the soap to use as an emulsifier in a garden spray using neem oil. The recipe I have for 1 litre mix states 1/3rd teaspoon of liquid soap. I just wanted to ask if you think it is ok to use in this way ie the soap content will not harm the plants. I note the bottles says that it is concentrated so would you suggest that I still use 1/3rd tsp per litre mix. YOur thoughts would be appreciated. My sister is an organic farmer in Broadway and I live in Stroud so I was especially pleased to find a local organic soap. Hi, just wanted to say that I bought your Lavender soap from Tesco last week & it is lovely. It’s really nice to see a big supermarket stocking products from a smaller producer. I can appreciate you have had to work hard to get where you are now – so keep up the good work, you really do have lovely brand. “Wow, wow, WOW!!!! I have just found your soaps in Waitrose and am so delighted. The bubble bath was very well received, and the sample soap included, which was an extra thought and much appreciated. You would not know fr­om the order, but, while I use the Cinderhill address when buying online in the UK, I actually live in a little place called, Pambula Beach, on the far south coast of New South Wales, Australia, so service from an online company is extremely important to me, and you guys exceeded all my expectations, and will always carry my recommendation. I just wanted to tell you my little order arrived safe and sound, and the note you included from me just added so much to the intent of the gift. Thank you so much for going far and above my expectations of an online shop.  With much thanks and appreciation – I’ll certainly use the Little Soap Company again, and it will carry my recommendation to all. I’ve just bought your unscented soap bar and used it this morning. Fantastic to find such a good product. Many thanks for making this product. I just wanted to say thank you for sending my order out so promptly – I ordered it on Friday and it arrived safe and sound this morning. I’ve just tried your Olive Oil Soap for the first time. I’ve got some patches of eczema on my arms (and overall my skin is quite dry), and I’ve tried pretty much every soap and body wash out there – all of which made my dry and sensitive skin even worse. But your soap is a revelation – I’ve already noticed a significant difference since I stepped out of the shower. My skin doesn’t feel tight, and the flakiness has pretty much disappeared. So a big thank you for that too. I’ll definitely be ordering from you again in the near future. Keep up the good work and I hope you have an ace week! I washed all 3 dogs yesterday and their coats are really lovely and very, very soft. Thank you for the photos! I will pass these on to Cora and the family! Thank you for a nice course yesterday, please say hi to Emma and thank her very much for a nice day for Cora, Emma was such a nice lady. As a result I know Cora will now be busy making soap and experimenting with recipes in France. There is a very big English speaking community in our area so if you ever feel you want to do some business of any kind in France, for example soap course or whatever, don’t hesitate to contact us. Just wanted to say I bought 2 of your soaps from the Orangutan Society and have just finished the first bar. I suffer from a skin condition called Rosacea, so I am hoping these soaps will help in not irritating my skin so much as others have done! Thank you very much, I have received the order. I am going on holiday next week to the far north west of Scotland taking my nearly 12 year old Springer. This is the 5th time of going and I want the soap to bath her in the Loch’s and streams up there. The water is so wonderful and fresh and clean I don’t like to put too many chemicals into the water. Hence buying your soap. She will jump into a Loch and then I will soap her down with your wonderful smelling soap, then back in for a rinse. She will be all silky and soft by the end of the 2 weeks. Surrey Hills and frequently has to be shampooed in their shower. Thanks for your lovely product. Thank you for your lovely parcel with my 2 soaps, one for me and one for the dogs. The soaps are really fantastic and they make my skin so lovely and soft and I spend all my time wanting to wash my hands!!!!!! I washed all 3 dogs yesterday with theirs and I cant say they liked it because they hate going in the bath, but theirs coats are really lovely and again very, very soft. As you said it is so much easier washing them with the soap instead of struggling with a bottle of doggie shampoo and it spreads out much better on their coats as well. I am a real fan and even more excited about coming to do a course with you and cant wait to get started. Great products Emma. Look forward to seeing you in October.